Neem has enjoyed thousands of years of cultural and religious significance, as well as a long history of use as an herbal remedy for dozens of conditions. Neem is an evergreen tree believed to be indigenous to Southeast Asia, and is now widely cultivated in many tropical areas of Asia, Africa, and South America. It is known to hold a special place in Indian religious and medicinal history, and the herb is growing in popularity around the world as more people learn of its astonishing health benefits and other uses. Soothing skin ailments. Because of its anti-inflammatory, antibacterial, and antifungal properties, neem is commonly used to heal minor wounds or longer-term conditions like eczema. Healing ulcers. Neem reduces the acid secretion in the stomach, and may aid in protecting the stomach lining, to help eliminate ulcers. Complementing malaria treatment. Growth and development of malaria parasites can be severely impacted with the use of neem, but it should not be used to replace any prescribed treatment for malaria. In addition to this already impressive list of medicinal uses, neem increases antibodies in the blood, thus boosting the immune system, and it has also been shown to possess diuretic, spermicidal, antiviral, hypoglycemic, and hepatoprotective properties. 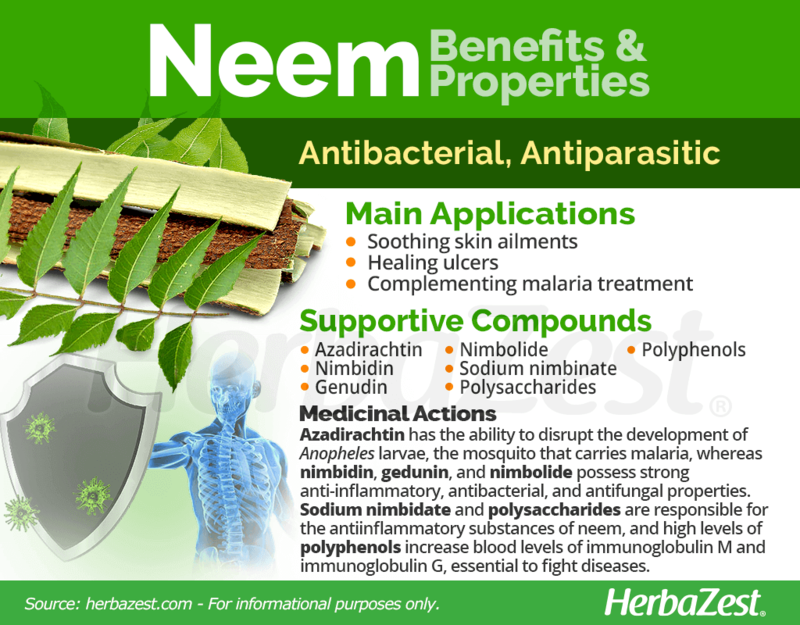 The most powerful antimalarial compound in neem is azadirachtin, a volatile oil that belongs to the family of limonoids and has the ability to disrupt the physical development of Anopheles larvae, the mosquito that carries malaria, which suggests that neem may be useful in eradicating other parasites as well. Nimbidin, gedunin, and nimbolide are also responsible for the anti-inflammatory, antibacterial, and antifungal properties of neem. Nimbidin is the key compound in healing ulcers and reducing stomach acid. Other compounds behind the medicinal properties of neem are sodium nimbidate and polysaccharides, which are anti-inflammatory agents, along with other antifungal and antibacterial chemicals. The immunostimulant activity in neem comes from its high levels of polyphenols, mainly gallic acid, epicatechin, catechin, and NB-II peptidoglycan. These compounds increase blood levels of immunoglobulin M and immunoglobulin G, both of which are essential in the body's ability to resist illness. Other herbs with anti-inflammatory and antimicrobial effects are marigold and peppermint, whereas sweet wormwood also exhibit antimalarial properties. Neem is most likely safe for adult consumption if not taken in excessive doses or for excessive periods of time. However, in high doses, it may cause damage to the kidneys and liver. The herb may also cause significant side effects in children, including nausea, vomiting, diarrhea, drowsiness, seizures, fainting, or coma, so should not be administered to children. Neem has been seen to interact with lithium, diabetes medications, and immunosuppressants. If taking any of these prescribed drugs, avoid taking neem. Additionally, neem is not suggested for people with diabetes or those about to have surgery because of its effect on blood sugar. Women who are pregnant, breastfeeding, or trying to conceive, should avoid any form of neem. Neem is commonly used as an ingredient in many Southeast Asian dishes; neem flower powder and neem flower rice are often added as ingredients to dishes, and neem leaves can be used in curries; however, neem's health benefits are concentrated in medicinal preparations. All parts of the neem tree possess medicinal value, although some possess different properties than others, and preparations can be made out of the leaves, bark, seeds, and flowers. Infusion. A tea or infusion made from neem leaves is one of the most common ways to consume the plant. This preparation is most useful for providing antibacterial and anti-inflammatory properties as well as soothing and preventing ulcers. Decoction. Neem may also be consumed as a decoction, generally made from the bark of the neem tree, in order to boost the immune system. Tincture. Tincture can be consumed internally to heal ulcers or applied to the skin to heal eczema and other skin problems. Essential oil. 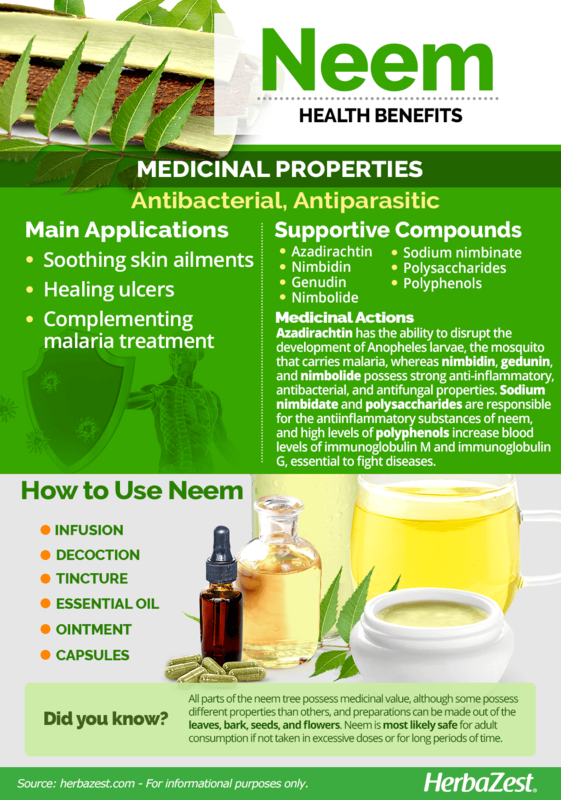 Neem oil is most often procured from the seed of the plant, and it is especially useful for treating malaria. However, the oil also has strong antibacterial and antifungal properties, and can be applied topically to heal skin ailments. Ointment. Ointment infused with neem is also available to soothe skin irritation and small wounds. Capsules. Leaves from the neem plant may also be manufactured into capsules, which can soothe ulcers as well as improve skin conditions even though taken internally. Dried neem leaves can be bought from markets that specialize in Southeast Asian cuisine, and may also be available in certain health stores. Fresh leaves may be slightly harder to come by for those in Western countries, but may be sold in local markets in regions where neem grows naturally. Neem supplements may also be difficult to find, although all medicinal forms of neem are readily available at online outlets. Some remedies may also be found at herbal shops. Neem capsules are the most likely to be found easily, and may be available at select wholesale retailers as well. Neem cultivation is easy in the right setting, as the neem plant can be grown in any tropical climate, and it is a hardy tree that gives excellent shade. It can grow up to 53 feet (16 m), however, so it should only be planted in an area with adequate space. Neem is generally propagated by seeds, but be sure to use young, new seeds, as older seeds may not germinate. If planting many trees, it is suggested to plant them in pots to protect them, and transplant them to the outdoors after three months. Neem trees can survive in a wide range of soils, even those within a range of acidity or alkalinity, with a pH up to 8.5, but a well-drained, peaty soil, also known as "black cotton soil," is ideal for growing neem. Neem trees need full sun, and too much shade will damage the growing plant. Moisture is not a concern with neem. The tree naturally grows in places with a rainfall of 450 - 1200 mm per year, but can survive in areas with a yearly rainfall as low as 200 - 250 mm. Areas that are waterlogged or have excess moisture, on the other hand, will result in the death of the neem tree. Neem can withstand heat up to 120°F (49°C) and cold temperatures as low as 32°F (0°C). Due to its antibacterial, antiparasitic properties, neem is not susceptible to pests, as the tree itself can be used as a natural pesticide. Neem is an evergreen tree that grows best in tropical climates. The neem tree can reach heights of 53 feet (16 m) and sports large, compound leaves. The leaflets are sickle-shaped and have serrated margins. In the summer, the tree produces inconspicuous white flowers. Neem grows quickly, and its lifespan is estimated to reach up to 200 years. 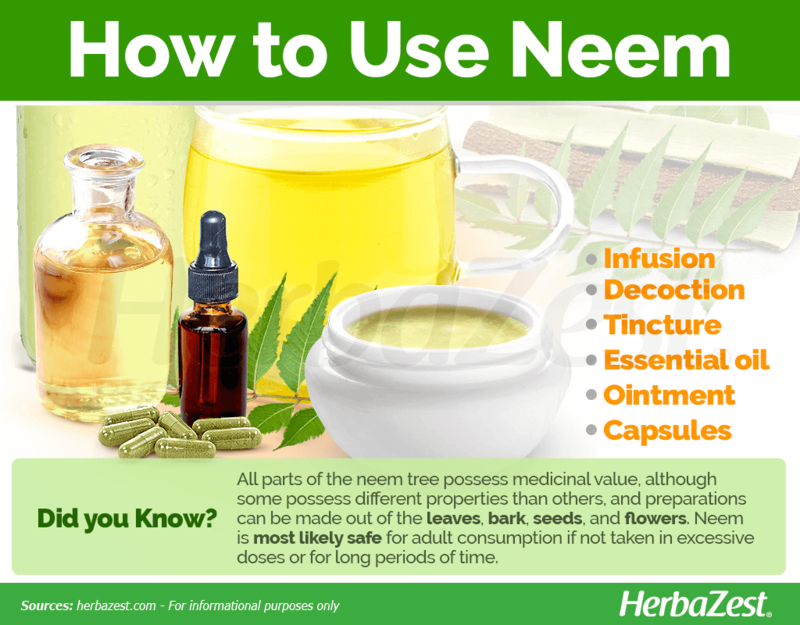 Neem is also known as margosa tree, nim tree, and Indian lilac. Neem, classified as Azadirachta indica, is a member of Meliaceae, also known as the mahogany family, and it is made up of around 600 species, most of which are trees and shrubs that thrive in tropical regions. Neem has several relatives, some of which share some of its medicinal uses. Melia azedarach, for instance, is a related plant that is useful for treating intestinal worms. Neem's closest relative is Azadirachta excelsa, which has also long been used in traditional medicine and it is the only other plant aside from neem to be classified into the Azadirachta genus. 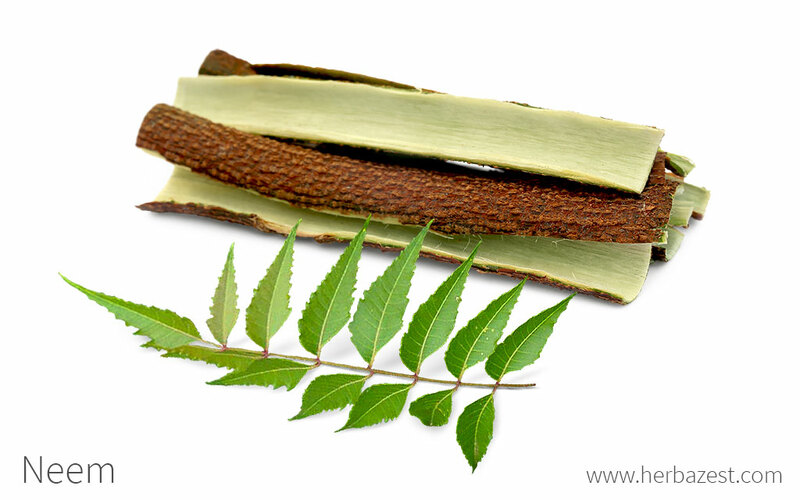 Neem has been an important part of daily life in India for millennia. Not only has it been integral in traditional medicine; it has also been an important part of religious ceremonies and traditions. It continued to retain its popularity through British colonization, as the British planted hundreds of neem trees in the new capital, New Delhi, as a way to try to provide shade and cool the city down. Neem has been recognized as a valuable crop, and it is growing in economic importance as well. The neem market is thriving in India, but countries such as China and Brazil are also leading in cultivation of the neem tree. Recently, the neem tree has been at the heart of a controversy over patents. International environmentalist groups have been fighting patents filed on uses of neem by large corporations on the premise that ancient knowledge cannot be patented, and the environmentalists have won several legal battles so far. Neem is integral in many religious celebrations in India, and it is so crucial that it is worshiped as a god among trees. It is also closely associated with the goddess Miriamman, and during the festival to honor this goddess, her statue is covered with garlands of neem leaves and flowers. Neem is also believed to ward off evil spirits, perhaps because of its close association with the gods. Personal care. Neem is a popular ingredient in many cosmetic and toiletry products, such as soaps, shampoos, lotions, and creams. Dental hygiene. The twigs are also commonly used as a substitute for a toothbrush; because of their antibacterial properties, they can be chewed to clean teeth. Ornamental. The neem tree is also useful for providing shade to hot, desert climates, as it can survive high temperatures and low rainfall. Rural Indian villages often have neem trees growing in the center, and Indian folklore holds that the shade under a neem tree is always severaldegrees cooler than other shade. Fodder and fuel. The leaves of neem are also used to feed grazing animals and the neem tree provides firewood for rural communities. Neem's variety of uses, both medicinal and otherwise, make it a phenomenally valuable herb. It is especially useful for healing skin conditions and ulcers, but it can help with several different conditions as well.